These are the photographs from the YouTube video plus many extras. NOTE: None of these photographs can be used without written permission from Cordell Andersen. I’ll insert a GIANT ANT! We open with the stunning view of Grandaddy Lake and Basin from the saddle of East Grandaddy Mountain. Meet George Beard and his wife Sarah Lovina Bullock Beard, from Coalville, Utah. George loved the High Uintas and once was talking to a government surveyor, a Mr. Lloyd, telling him he knew where the largest Uinta lake was found, calling it “the GRANDADDY OF THEM ALL!” Lloyd thought that was a good name for the Uintas largest lake, and thus we have GRANDADDY LAKE and BASIN, named by this outstanding pioneer artist and photographer whose collection is found at the Harold B. Lee Library at Brigham Young University. George also named the first 13,000+ foot mountain you see hiking to the east on the Highline Trail , calling it Mount LOVINA after his beloved wife. 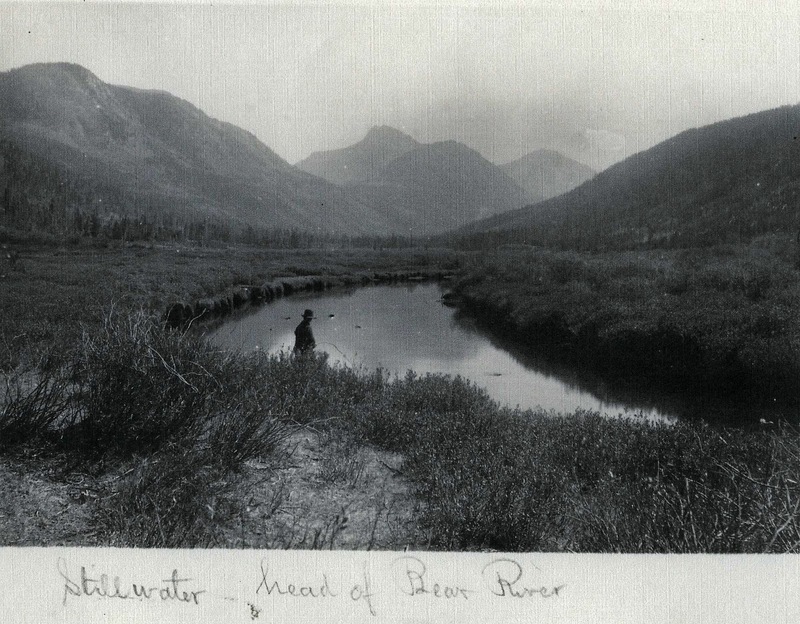 NOTE: A couple of years ago when giving a speech in Evanston, Wyoming I met one of George Beard’s great grandsons, Shawn Moore, and spent some time with him at his property along the Bear River in the Uintas. 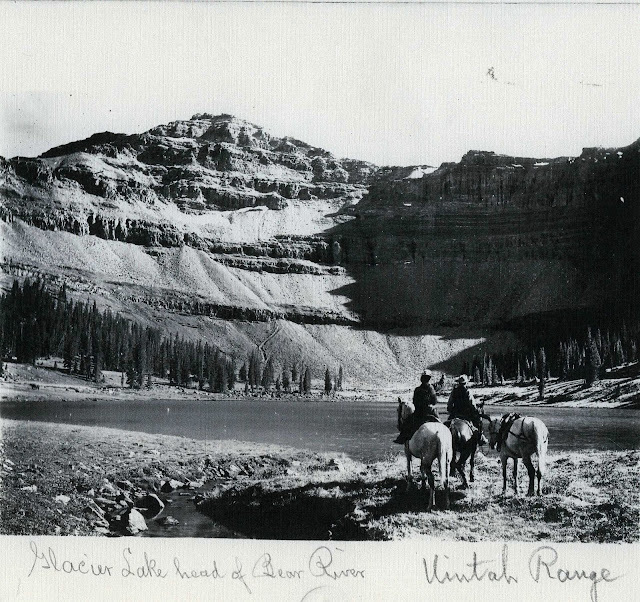 He graciously gave me a few of George Beard’s photographs (from the collection at the BYU Library…which I insert below since we are talking about him and his love of the Uintas. 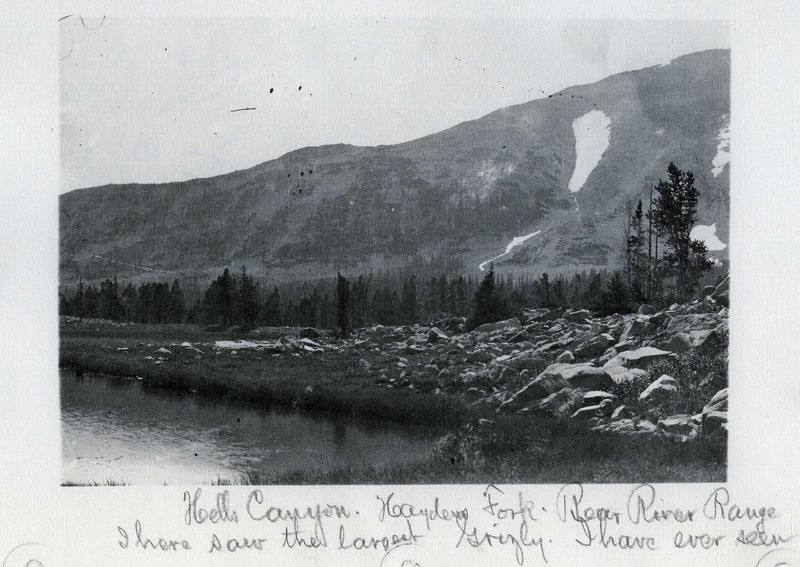 You’ll notice he called this “Glacier Lake” which today is ALLSOP Lake at the head of the East Fork of the Bear River. We notice his wife Sarah Lovina with him as often was the case. If you look carefully you can see George in the shadows of the above photograph painting the scene. 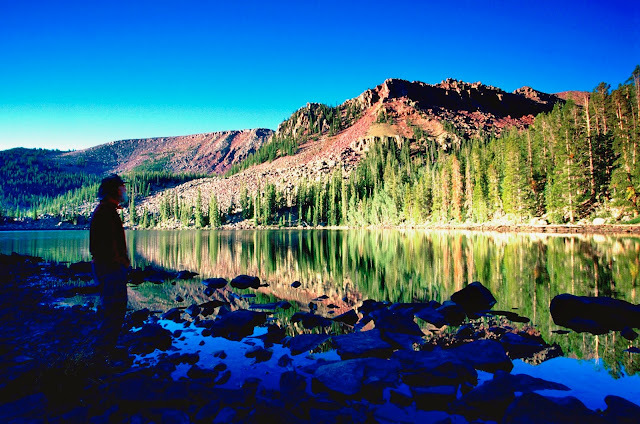 I started this photographic essay with the spectacular view of Grandaddy Lake, you see me enjoying above in a point-and-shoot camera shot taken by my daughter, Mahana, when we camped on the saddle on my third trip up there climbing up from the headwaters of South Rock Creek on the south side. Below from the north we look over Grandaddy Lake at East Grandaddy Mountain with the yellow arrow pin-pointing the spot where I set up my bivouac camp. No level ground was available so I had to build my own “INTELIGEL BED”……. NOTE: When I was doing this I was listening to KSL radio and Doug Wright doing a commercial about so many with sleep problems, his solution of course being “The Inteligel Bed”….. which wasn’t exactly available at my tough spot, so I BUILT MY OWN you see above! ….with my poncho lean-to pitched over it to get a series of photographs from late afternoon until early morning as you see below….first smoky due to forest fires to the north in Wyoming, then it began clearing….. 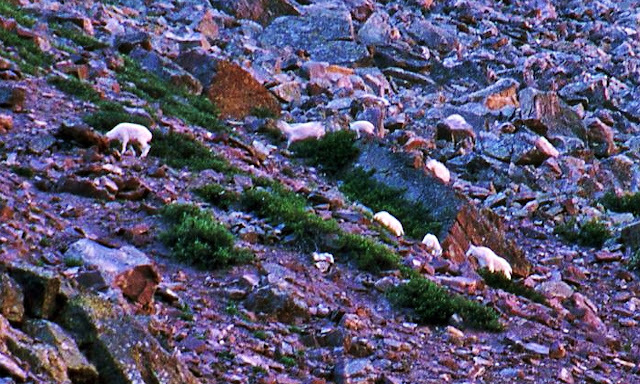 I was fortunate on that trip to also photograph a series of pictures of a young Rocky Mountain Goat. This photo/essay, we could call a documentary, deals with Utah’s largest Wilderness area we see above, but specifically the GRANDADDY BASIN located in the southwestern portion of the area. 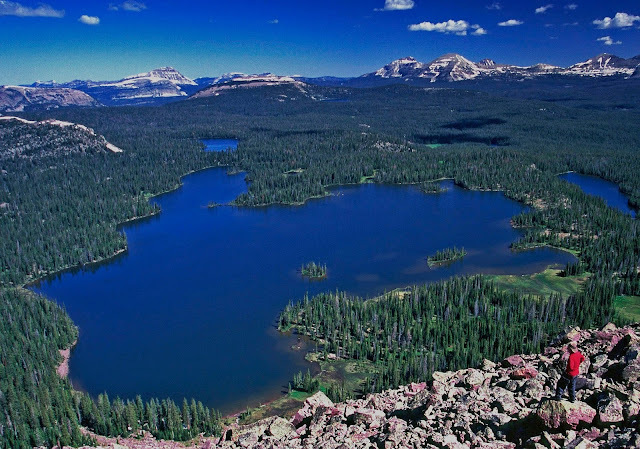 We will visit briefly all 24 of the named lakes that the Division of Wildlife Resources considers serious fisheries that have been labeled in the Google Earth view above…except Jeff Lake with no fish, and another not included on the map, La Marla Lake. 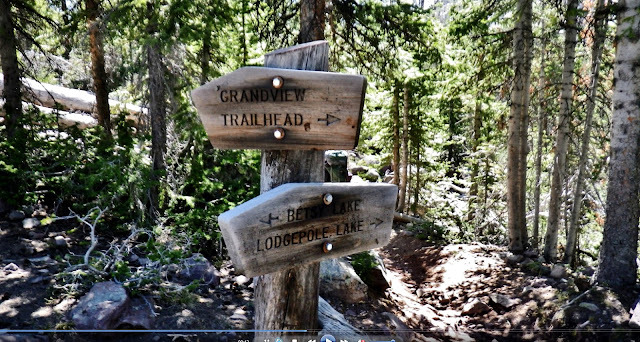 To get to the Grandview Trailhead, the “Gateway to the Grandaddies,” go to Francis from the Wasatch front by going through Heber, or to Kamas and go 2 miles south. At Francis you go east towards Woodland. Following Utah Highway 35 up over Wolf Creek Pass. From the summit of Wolf Creek Pass you drop down to the North Fork of the Duchesne River. The Hanna Country Store is 5 miles further to the east. 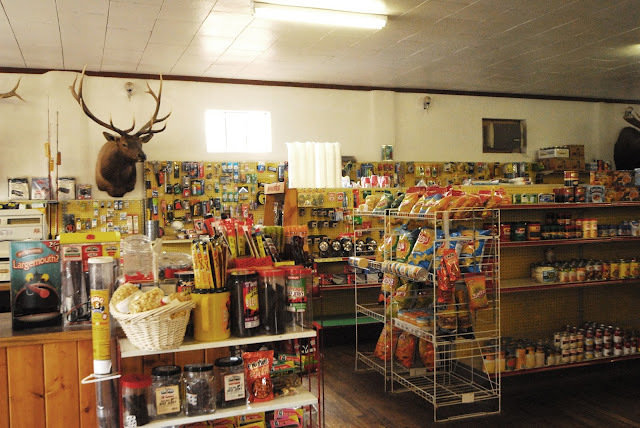 Here you can get what you might have forgotten, or once your hike is over, you can get some good refreshments here. 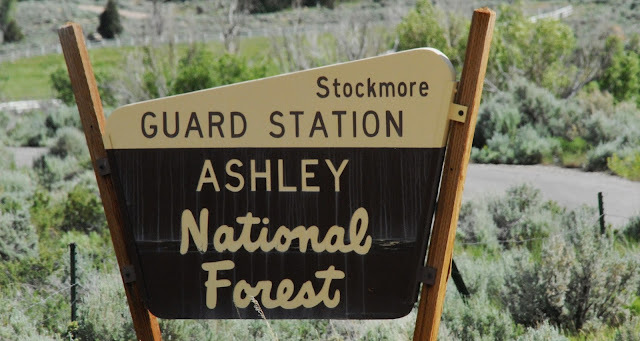 Then backtrack to the junction where you turn north along the North Fork of the Duchesne River, where also is located this Guard Station….named after a Mr. Stockmore who, along with a partner, pulled off a “FAKE GOLD RUSH” absconding with their ill gotten riches and leaving behind a ghost town….with a bunch of disappointed and infuriated gold seekers. You’ll get the whole story in the unique book soon to be produced on the High Uintas. At 6 miles you pass the Defa Dude Ranch, and just a little further turn to the right at the sign to the Trailhead. This is where the Trailhead was many years ago, when on my introductory trip to the Uintas in 1952 , we drove the dirt Wolf Creek Pass Road and here parked my old 1939 Plymouth and began the all night hike…..a Friday night, to get to the Grandaddies for the Fish Opener on the first Saturday in July. 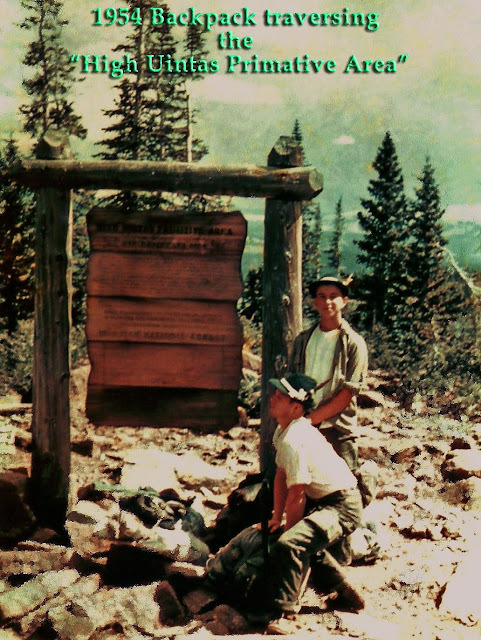 By 1954 the three of us took two weeks to backpack across the entire High Uintas Primitive Area. 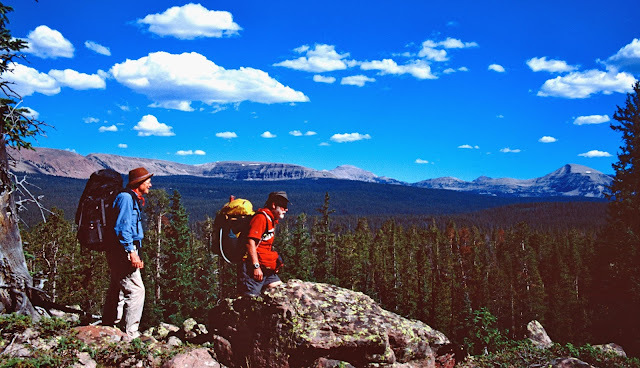 Here we are at Hades Pass where there was a wonderful sign about the Primitive Area….that by 1984 became the High Uintas Wilderness Area–twice the size of the original Primitive Area. The wonderful sign has disappeared as have many from the old days, with some pictured in this documentary for history’s sake. A bit over halfway to the Trailhead you pass Splash Dam and the lake it has formed for many years…..but something happened this year, draining the lake leaving as we see below. 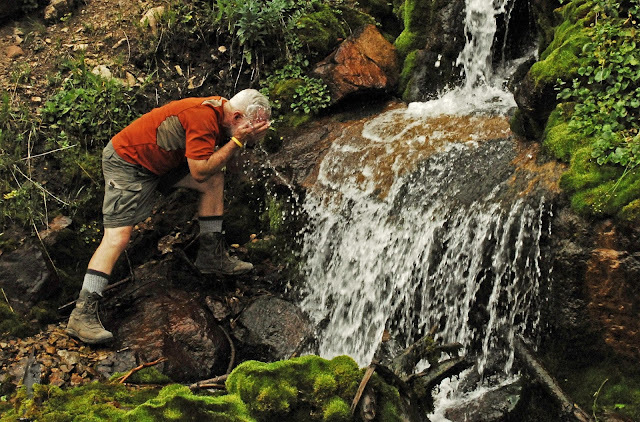 Near the Trailhead you pass a wonderful cascade of pure water where, coming and going we always stop to refresh ourselves, and fill our water containers. 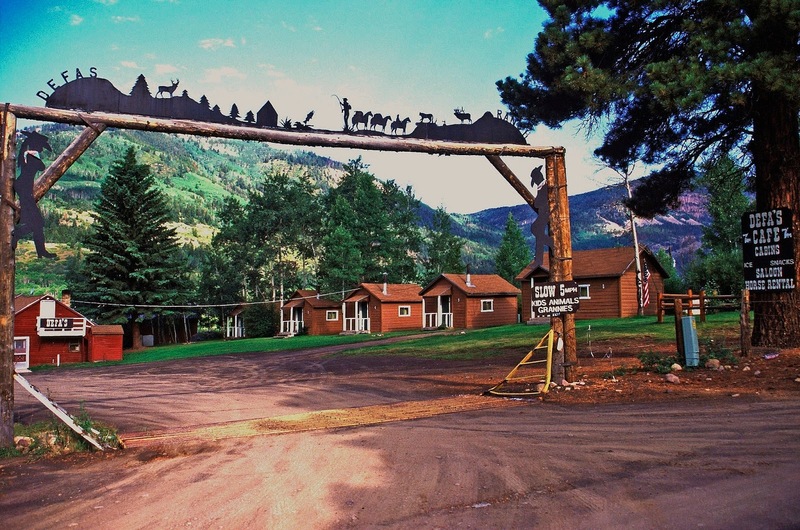 The trailhead is in a very picturesque spot–probably the best in the entire Wilderness. From here it is 4 miles to Grandaddy Lake. 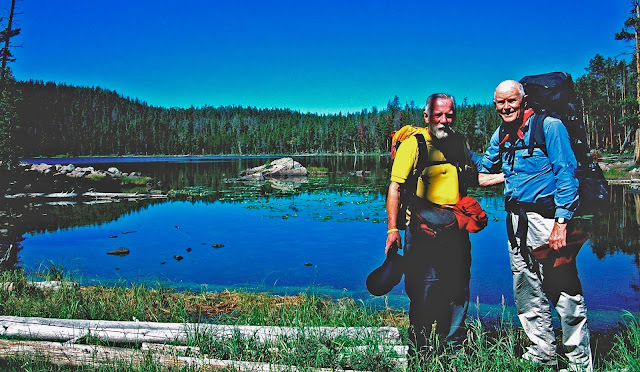 Many now do the hike to Grandaddy Lake and area as a day hike, such as was done on June 12th by old friends I hadn’t seen in more than 50 years. The Turnbows from Hanna did it that day on horseback as do many. 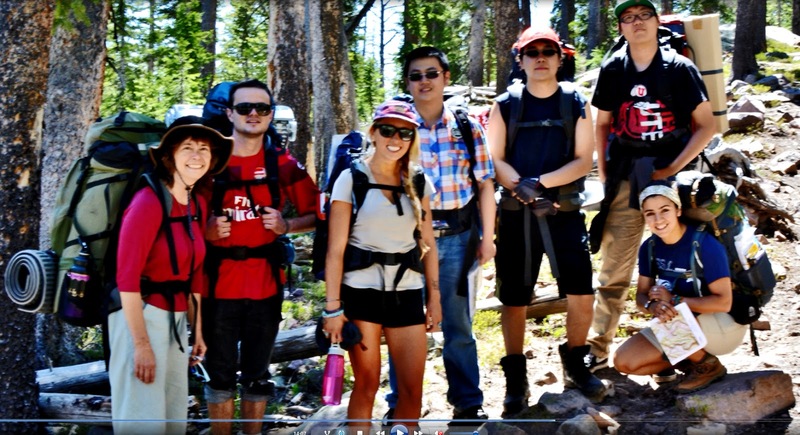 And, as I was preparing to backpack up the trail to show the world all the Grandaddy lakes, I heard someone yell, “HEY, CORDELL!” and met again friends I met on this same trail in 2013….the great backpacking family of Mike Slater, Division of Wildlife Resources employee from Springville. The map at the Trailhead shows basically the lakes we will now visit on a whirlwind backpack tour. Some of the distances are shown just as you start up the trail. A short distance from the trailhead you cross the creek on this footbridge, seeing it above as it was on June 15, 2015. Below you see it two weeks later in 2013 when a lot of snow fell, and there was heavy runoff. The trail nearly had a larger stream flow than the creek itself! 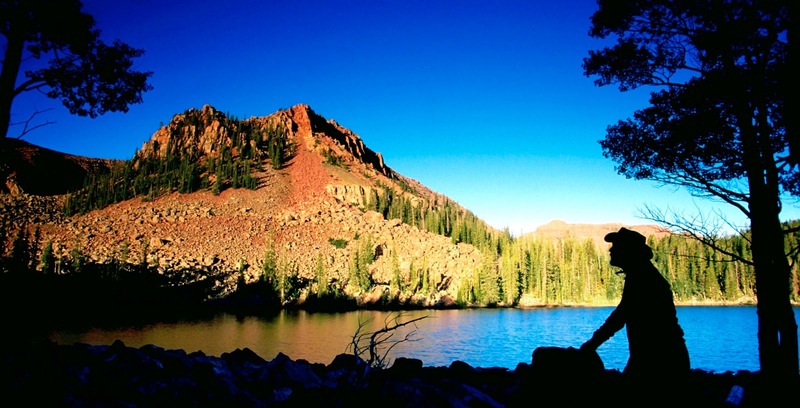 Many backpackers visit this pristine Wilderness each year, yet it continues to be a Wilderness that can be enjoyed by all–with accessible lakes right on the trails, but also remote lakes off the beaten path where sometimes you can go for days without seeing another human being. Just a bit up the trail from the bridge you come to the Wilderness Boundary. Many portions of the trails in the High Uintas are not for the faint hearted, but they offer great challenges for the adventurer. I’m in my 80th year, and I brag about my fastest hiking speed being, “my stalking pace” which permits me to see and appreciate unending VISIONS OF NATURE, such as SPRING BEAUTY you see above–a tiny little 1/4″ jewel, along with my collection of over 317 varieties–and counting, of other wildflowers from the foothills of the Uintas to Kings Peak, and literally hundreds of varieties of colorful and fascinating life forms of the mushroom family like, ORANGE SPONGE POLIPOR, we see below. 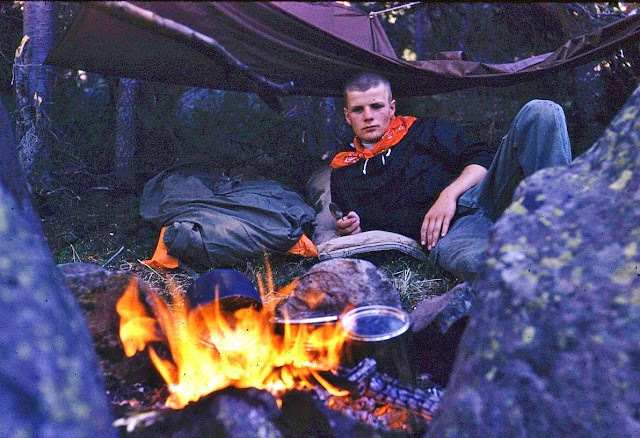 And, once in a while we meet great backpackers, lovers of the outdoors like Ricky Fowler and his companion, Buddy. 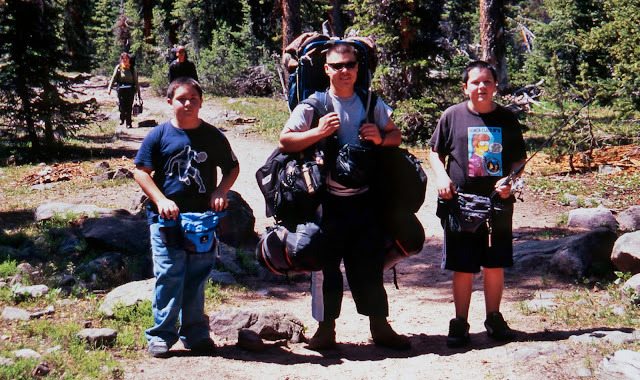 Even a couple of times you would have run into the Annual Andersen Family Backpack that twice has gone into the Grandaddies…..
…..this time with a couple of grandsons from New Mexico on their first backpack who needed a little help from my Marine son, Jesse….and he’s loving it–showing how tough Marines are! The beautful little yellow flower we see early in the season is GLACIER LILY, or FAWN LILY. You’re seeing it here like you’d have to see live by getting down on your belly with a magnifying glass! MARSH MARIGOLD, one of the first flowers in the season, sometimes coming right up out of the melting snow. ….such as the Phillips Family we see above. We have now come to Hades Pass and begin dropping down seeing first Heart Lake, that on June 15, 2015 still had a little ice left. As we continue down into the Grandaddy Basin, we get a glimpse above of GRANDADDY LAKE….with an overcast sky that is darkening with rumblings of a storm to hit soon. 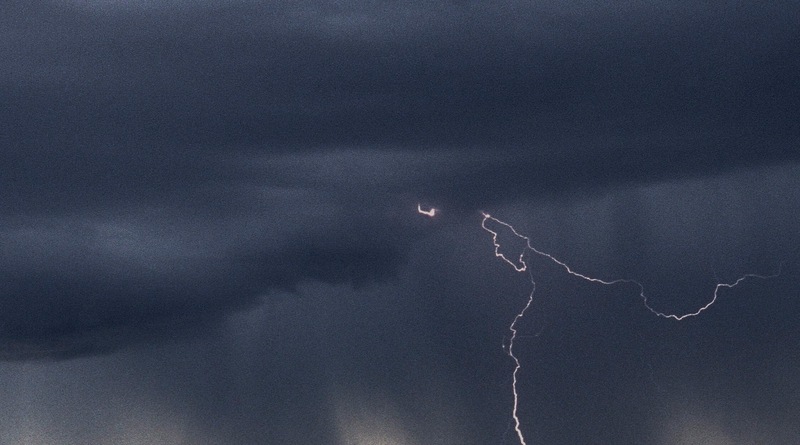 Then the storm releases its fury on us, but…..
….good backpackers, like Mahana Andersen, are ready for it with proper gear, and apparently REALLY LOVES IT! So again we glance at the GRANDADDDIES on Google Earth see and the lakes we will get to know. 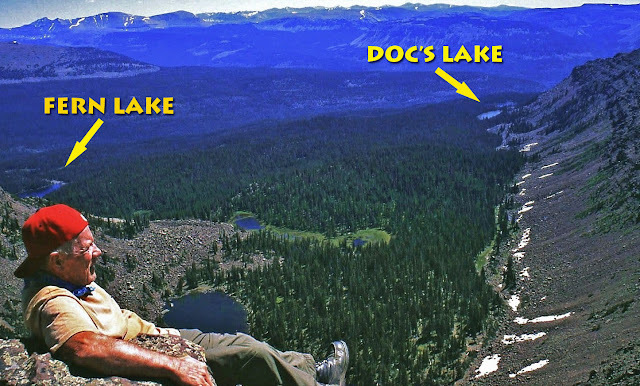 From the very top of East Grandaddy Mountain, I’m looking at the next two lakes we will visit: FERN LAKE and DOC’S LAKE. To get to them we drop back down to Grandaddy Lake and begin circling the west side of the lake, searching for the streams that enter the lake. 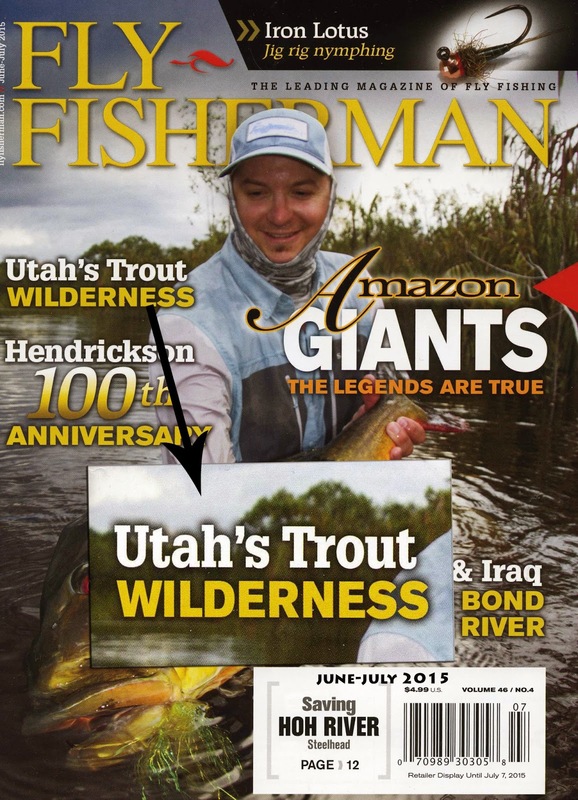 There are three of them that offer us another wonderful VISION OF NATURE in the later half of June and early July when hundreds and thousands of native cutthroat trout come up from the lake to spawn. 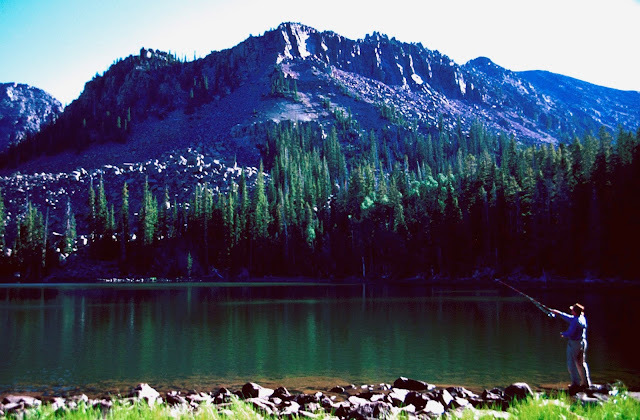 We continue to work our way around Grandaddy Lake with Mt. Agassiz seen to the north, and a jewel of nature at our feet–BOG LAUREL, we will see it like never before a little later. 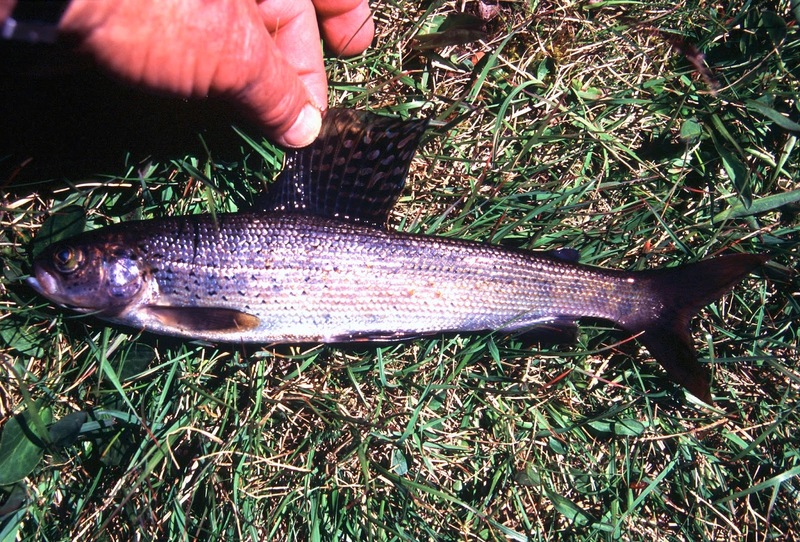 Along with the native cutthroat trout we have seen spawning, there are also eastern brook trout in Grandaddy Lake, like this nice one I caught a few years ago. LEAVE NO TRACE…not an energy bar wrapper, gum wrapper, cigarette but, nothing from civilization. 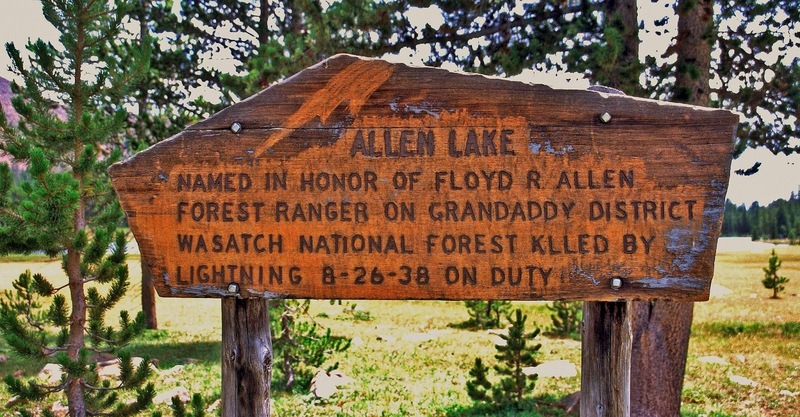 A couple of miles down and east from Grandaddy Lake we find FERN LAKE, a favorite of many of us from more than 60 years ago. 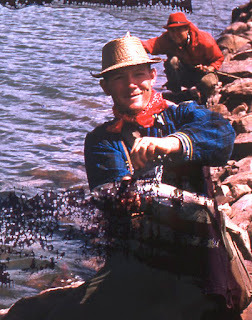 For example, about 54 years ago here I am behind the camera taking a picture of my younger brother, Howard, at our camp on Fern Lake. 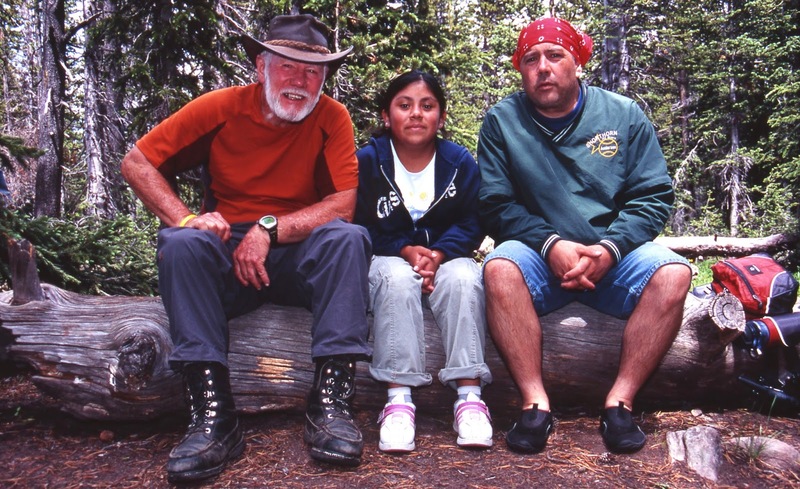 Soon after that trip with Howard, I moved to Guatemala where I lived and worked for 35 years in a remote area working among the Mayan people (http://www.guatemalanfoundation.org/) , returning to the U.S. in 2002 and in 2003 beginning the HIGH UINTAS WILDERNESS PROJECT. Contact was renewed with Ted Packard, and in 2004 we made our first backpack in all those years to….yes, you guessed it, to Fern lake. The next day we bushwhacked southeast to remote DOC’S LAKE we see below….our …..
Doc’s Lake is found at the eastern end of Grandaddy Mountain. We didn’t see much sign of anyone having been there in recent years. 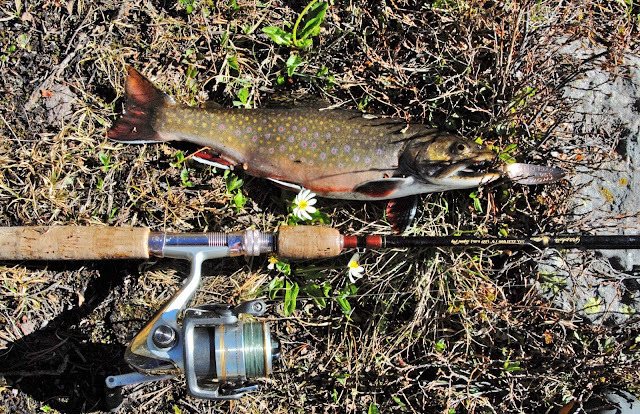 Fishing was good for Eastern brook trout. One can get to Fern, and Doc’s Lakes, as well as the Grandaddy Basin from the Rock Creek Trailhead at Upper Stillwater Dam. Up past the reservoir you come to a junction where, years ago in 2003 when I explored this trail, this sign was there on that trail. 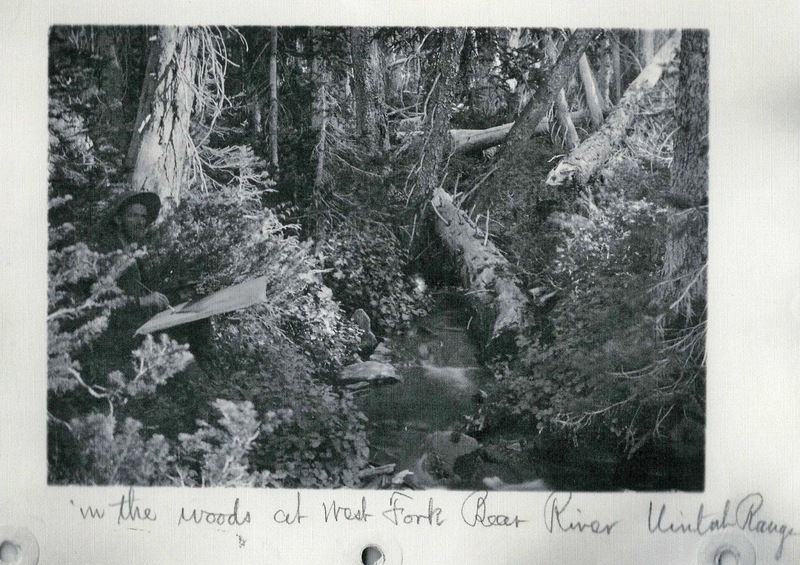 It had not been maintained yet that year and perhaps little for a number of years, and it was a tough hike with a lot of downed timber. 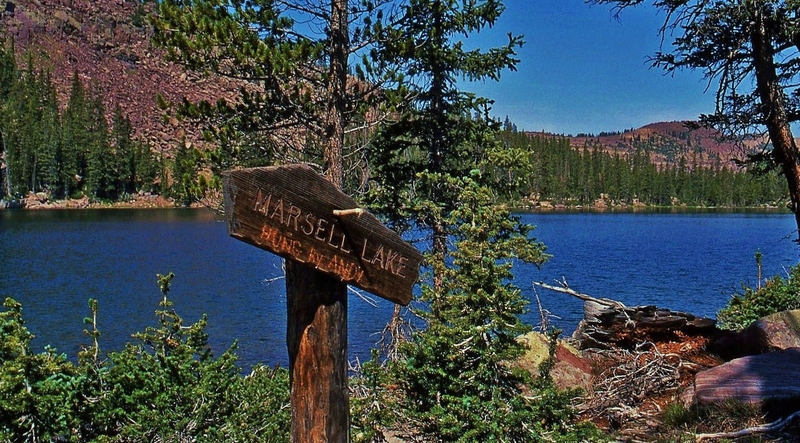 At the inlet to La Marla Lake, is where a faint trail takes you to Fern Lake. 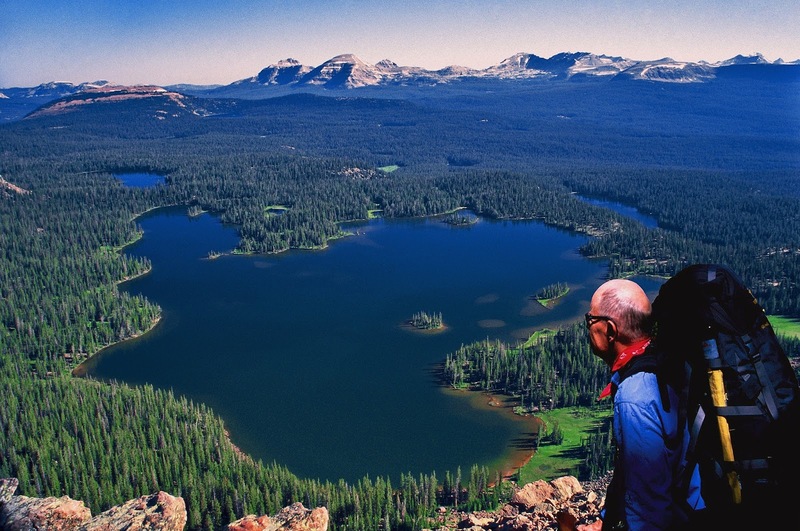 Following the main trail you soon come to LODGEPOLE LAKE we see below. 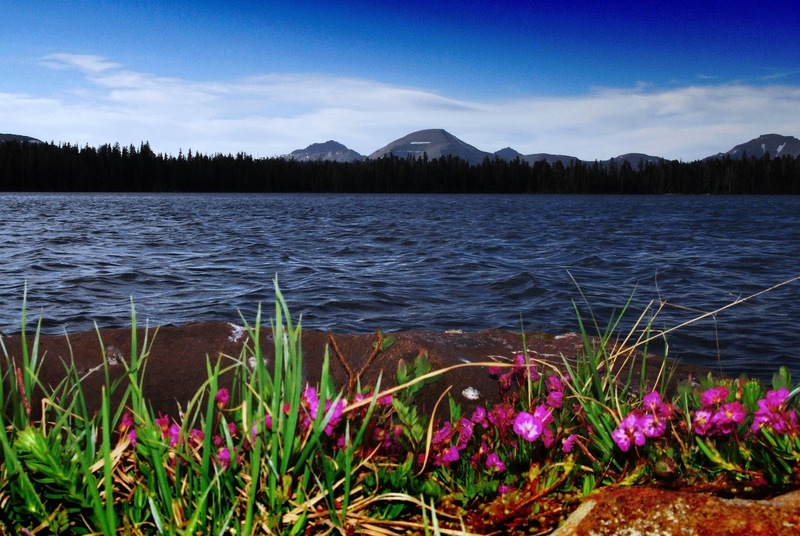 This lake has eastern brook trout. 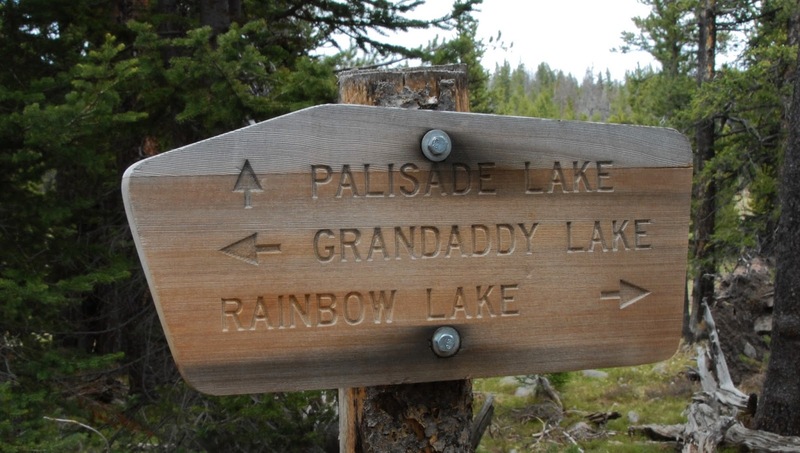 From here the trail climbs up to Grandaddy Lake and circles to the north where you come to a junction with the signs we see below. In 2003 when beginning the Project, I found at this junction a large sign on the ground and stood it up for this picture. It has since disappeared, as have many signs photographed in the past. 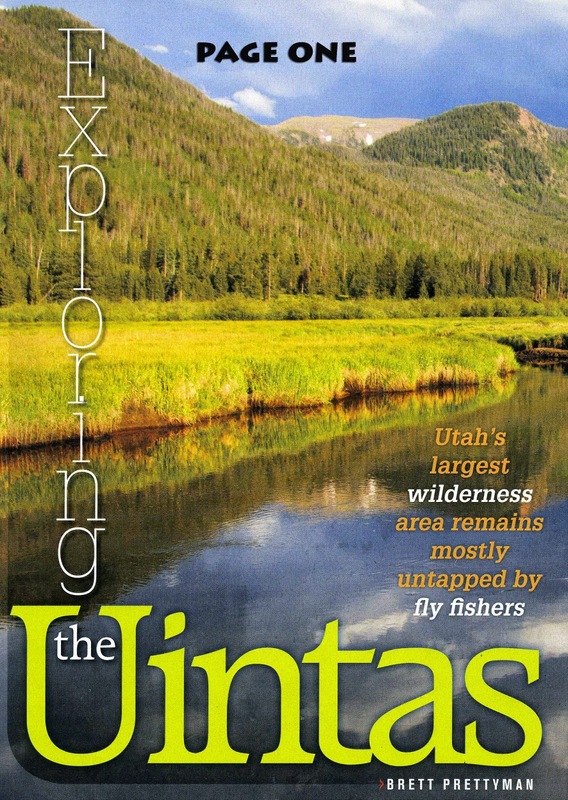 Some of them are found in storage rooms at Forest Service offices surrounding the Uintas, others gone forever. From the above junction we follow the trail north and immediately come to BETSY LAKE that provides fishing for eastern brook trout. Halfway around Betsy to the north you come to this junction. 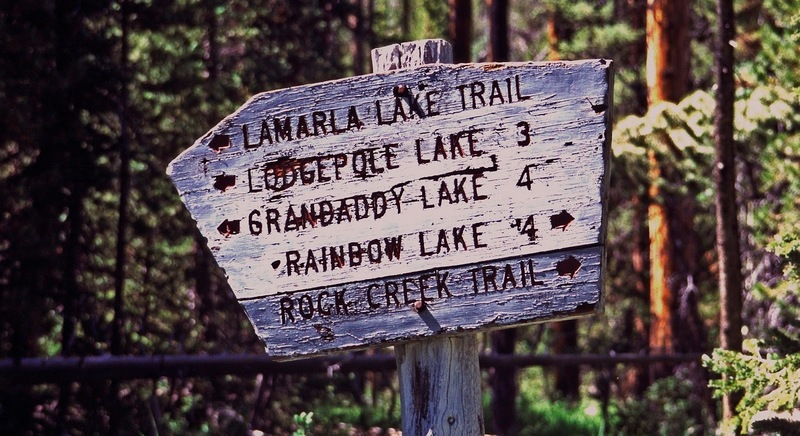 We take a right and head down the trail that points to Rainbow Lake. 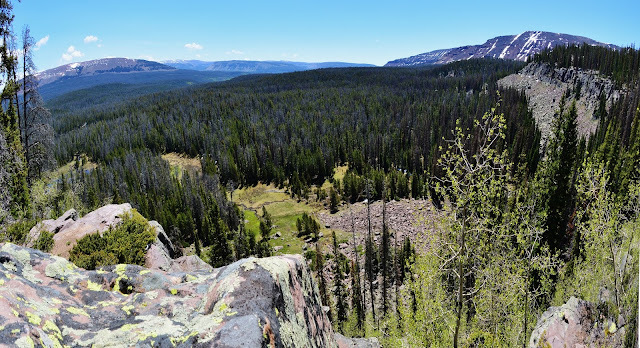 As you begin to drop down you will notice to the right that you are near an escarpment from which you can view the High Uintas to the southeast, with Grandaddy Mountain on the right. The delicate leaves of Utah’s new official tree, THE QUAKING ASPEN, are beginning to sprout. I consider this an excellent choice, rather than the previous Colorado Blue Spruce that didn’t make any sense. 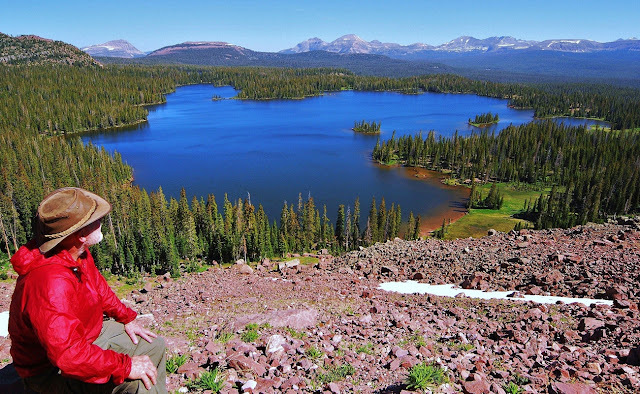 I have explained in previous posts, such as my efforts to get to Lake Lorena on the East Fork of Bear River, why “she” is a very good choice, as she in many respects gives life to the mountains and saves them from ecological disasters–like after forest fires or an avalanche. After dropping down quite a bit you cross a foot bridge over the creek that joins others to become the West Fork of Rock Creek. A little further, near the trail junction to Palisades Lake, we meet a backpacking class from the University of Utah, led by Ted Packard’s son, Mike, and have a great reunion. We briefly detour up that trail to visit our next lake. Above you see me showing one of the reasons why I have no interest at all in trekking poles….I need my hands for more useful things, such as my fishing rod, my camera always at ready, or a little bagful of munchies, any of which help me much more….besides, if I used them I would never be able to live with the reactions of my Marine sons to trekking poles! Near the lake we meet the other part of the “Backpacking Class” led by Hilary Bean on the left. 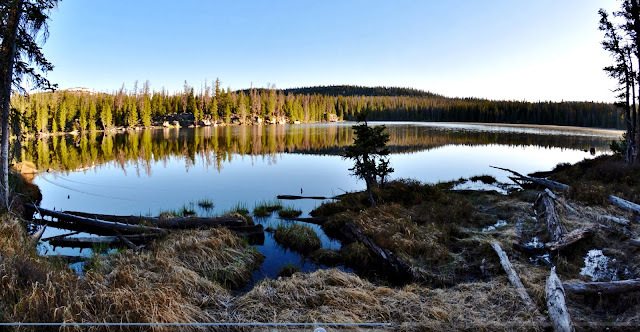 We then visit briefly PALISADES LAKE our …..
….and catch a few Eastern brook trout. Then back to the junction and down the trail that parallels Brinton Meadows where on one trip I was fortunate to photographs some bull moose you see below. Then back to the trail soon crossing another foot bridge over the creek draining Brinton Meadows. 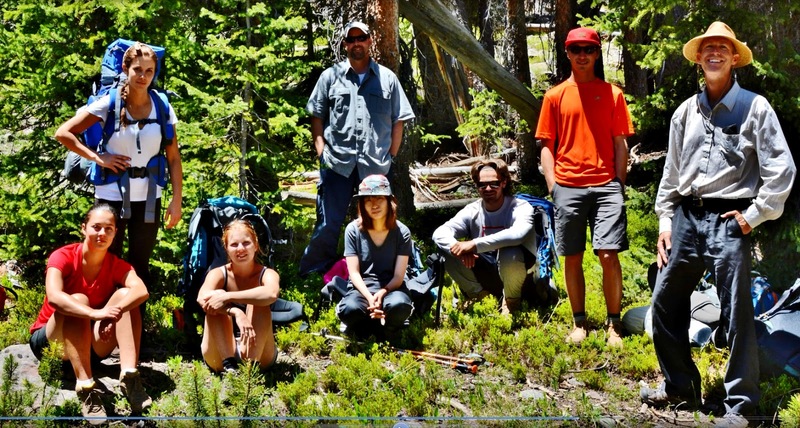 During our hikes in the Uintas we see….but rarely focus on the underbrush on the forest floor. Early in the season, tiny flowers, that most hikers never notice, develop about 1/8th of an inch in diameter. After a lot of searching I so far pin it down to the HEATH FAMILY, with about 125 genera and 3,500 species, the one that comes closest is Kinnikinnick or Bearberry. 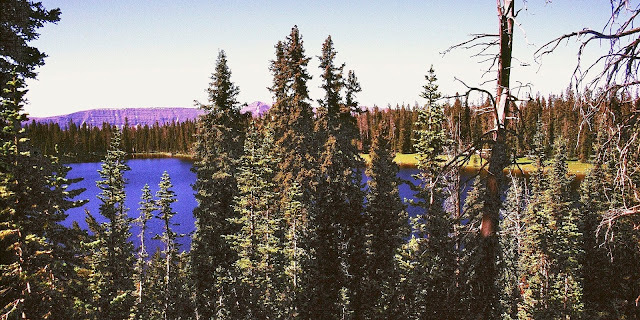 Then down the trail a mile or so to LOST LAKE, our…..
As we hike by the lake we do so carefully looking for a faint, unmarked trail that takes off to the right, or the south. Here it is, so we take another detour for about half a mile and come to…..
John Wesley Powell (March 24, 1834 – September 23, 1902) was a U.S. soldier, geologist, explorer of the American West, professor at Illinois Wesleyan University, and director of major scientific and cultural institutions. He is famous for the 1869Powell Geographic Expedition, a three-month river trip down the Green and Colorado rivers, including the first known passage by Europeans through the Grand Canyon. Etc. Back to the main trail at Lost Lake, we begin to drop way down to about 9,800 ft. and cross a foot bridge over Fish Creek that originates in nearby Rainbow Lake. Fish Creek is the main creek that drains the Grandaddy Basin. Downstream it joins other creeks and becomes the West Fork of Rock Creek, just before joining Rock Creek above Upper Stillwater Reservoir. This spot is also a major trail junction, one trail going down Fish Creek to Rock Creek; another we will take going northwest to Rainbow Lake which continues on to another junction near the inlet to Pinto Lake, one fork dropping down into the Duchesne River canyon, the other continuing north crossing the river and then joining the Highline Trail. 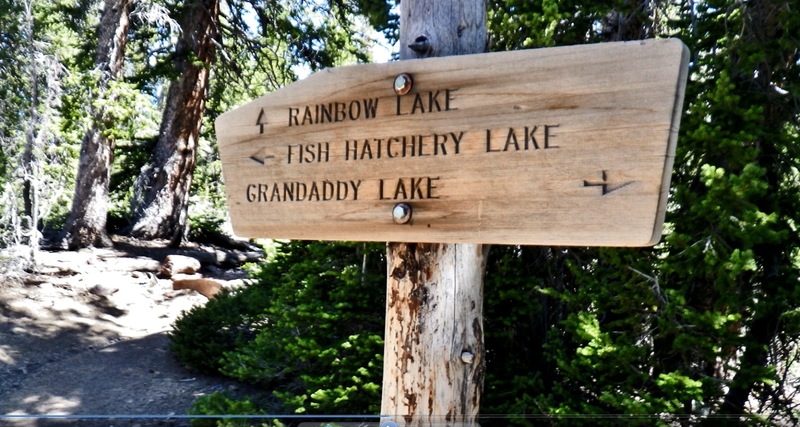 Once crossing the bridge we come to RAINBOW LAKE which will be our…. Rainbow Lake has Eastern brook trout, like the one you see below. Ricky Fowler, we met earlier with his dog Buddy, told the tale of having great fishing here, that provided his dinner, and his breakfast, with the largest catch that was released being a 15 inch long brookie. 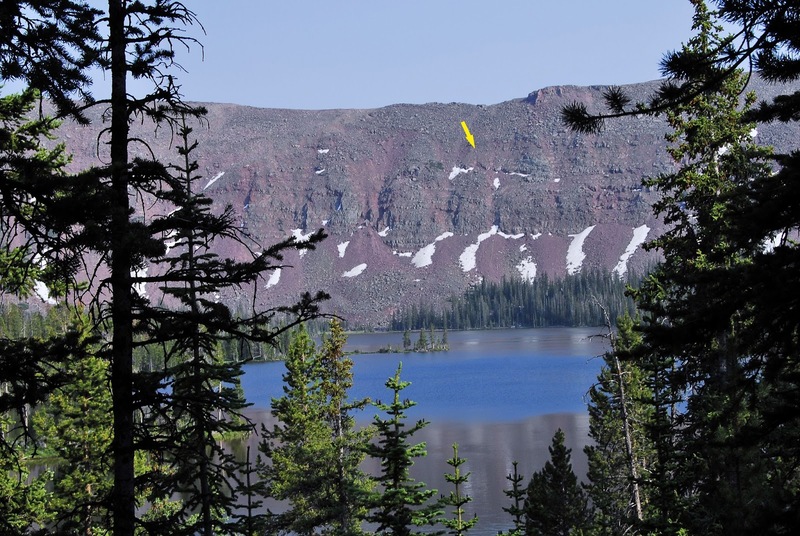 …….with a very important trail taking off to the northeast that leads to the Four Lakes Basin, with one trail climbing Cyclone Pass on the east, and another fork going northwest to join the Highline Trail near Pigeon Milk Springs. Somehow I failed to get a picture of the sign, but up that trail a couple of miles we come to our next lake. It is BEDGROUND LAKE, small, but guide books give it credit for having produced large brook trout….but it has never worked that way for me, and for others I have talked to–much of it depending on when in the the usual 5 year growth cycle you happen to make your visit. 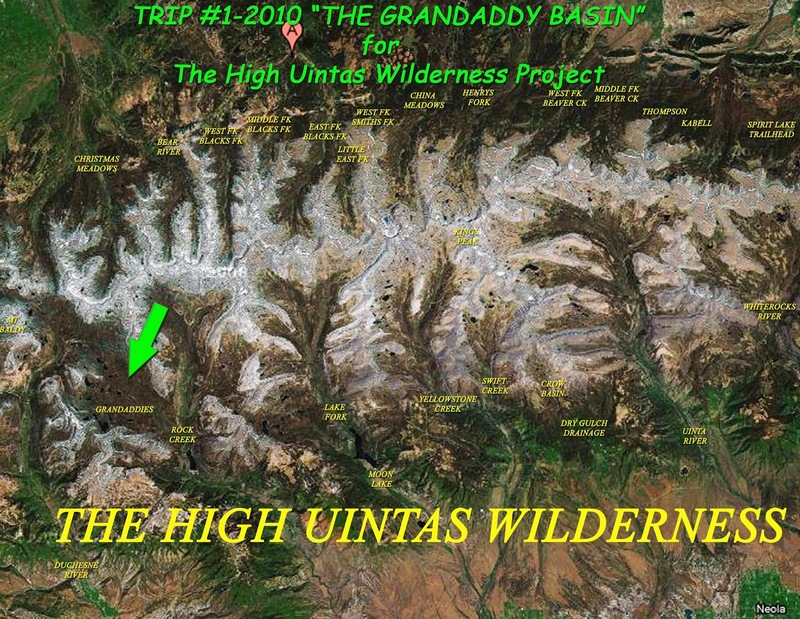 But it is part of the Grandaddy Basin and will be our…. From Bedground Lake you leave the trail and bushwhack (easily) due east for about a mile and come to ALLEN LAKE, which below we are actually seeing from above it to the north. 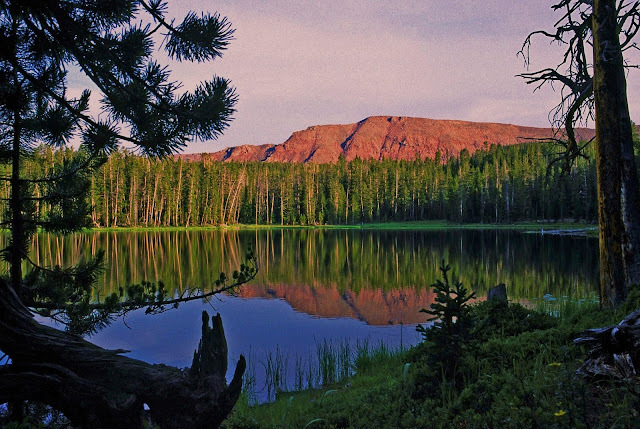 I visited Allen Lake the first time in 2003 on my 27 day “expedition” crossing the Uintas. I found its sign very dark and not legible in a photo so I went to work scraping it, including with a bolt of lightning, revealing it’s fascinating history you can read yourself below. The next time I visited, the sign posts had rotted away and the sign was on the ground. I propped it up off the ground to keep it from rotting. A year or so later some friends went in there with bolts, and tools to do a worthy job with the sign. 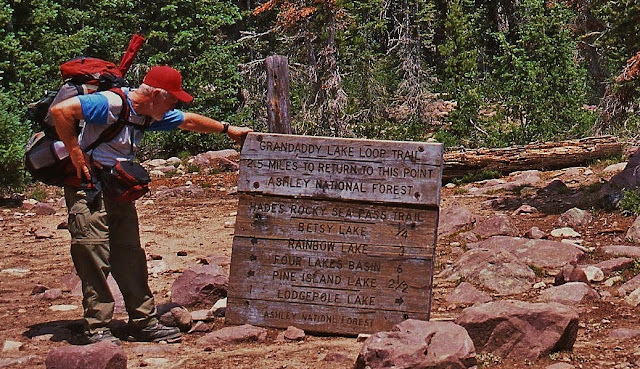 Now, in 2015, my friend and Forest Service employee, Jeff Mitchell, tells me the sign doesn’t exist anymore! So my photos become important for history’s sake. 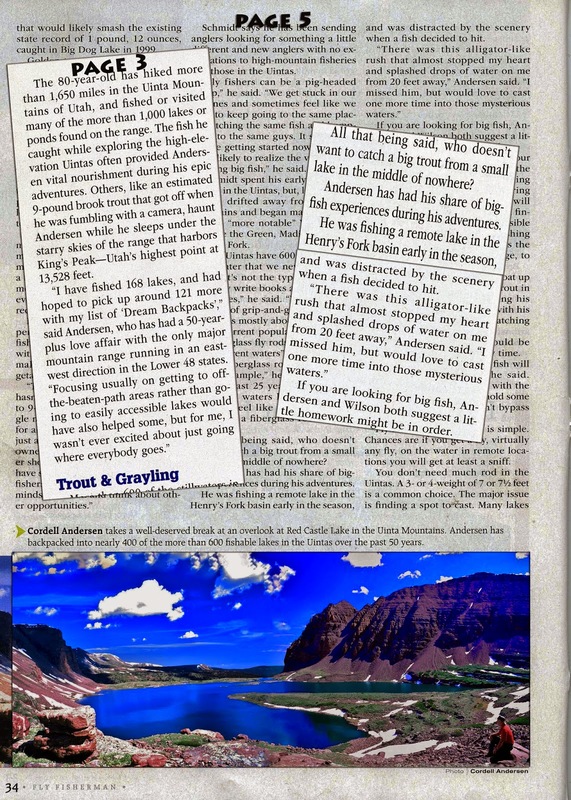 Allen Lake is famous for its Arctic Grayling, several publications speculating that the Utah State record grayling will come from here…..but…. ….my friend Ted Packard already caught one that will be hard to beat you see in the above damaged photograph from 1962. “Damaged” as after leaving Lake Atwood my camera was dropped into one of the Chain Lakes, but a few shots were saved…but damaged. I caught one also near this size….I’ll insert that photo below. 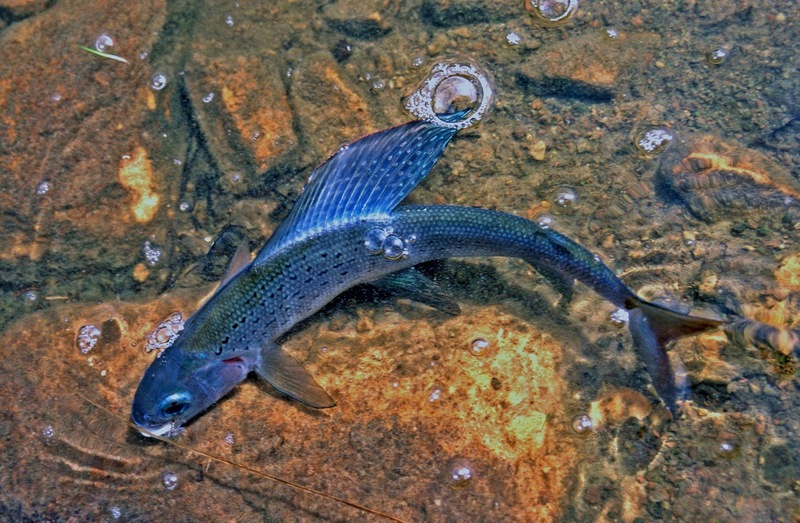 You might have noticed that we were doing something unusual, catching them on spin casting lures, rather than flies. Grayling have small mouths, but these were big enough to grab on to our lures. From Allen Lake we backtrack down to the Fish Creek Trail to visit our next lake…. So we return to the trail near Rainbow Lake and come to a creek crossing you see below. Rather than wade it, we will bushwhack around the east side of the lake to visit relatively virgen territory where the trail returns after Governor Dern Lake. We soon come to larger GOVERNOR DERN LAKE which will be our…. 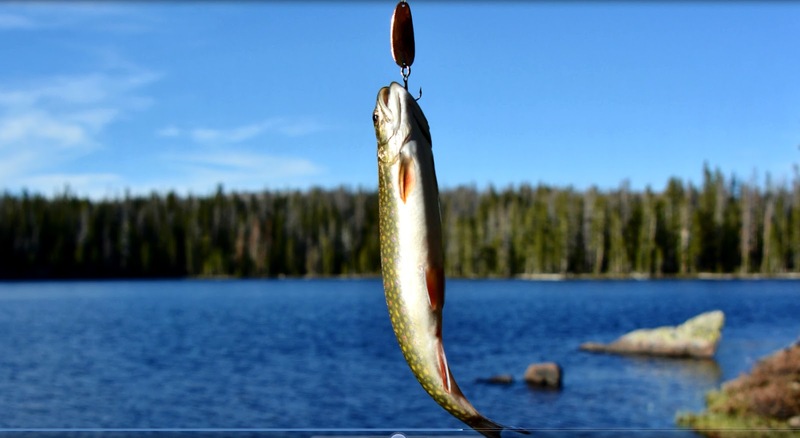 Governor Dern lake produced brook trout like you see here. Near the inlet to Governor Dern Lake we come to the trail again that crosses the stream to come back to our eastern side. 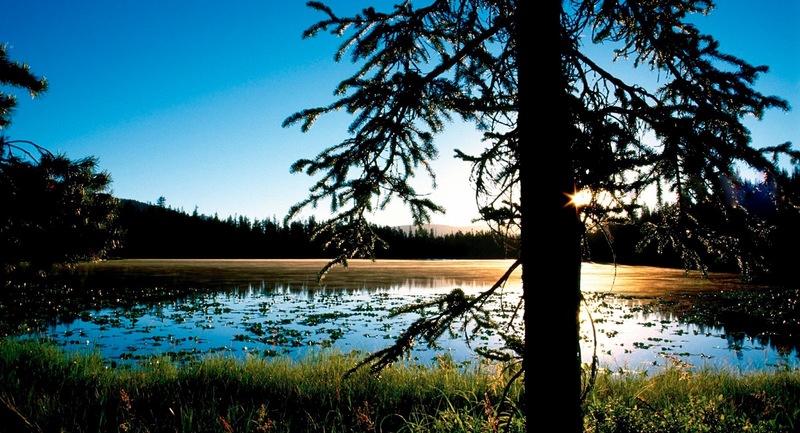 We continue a short distance and soon come to our next lake…. 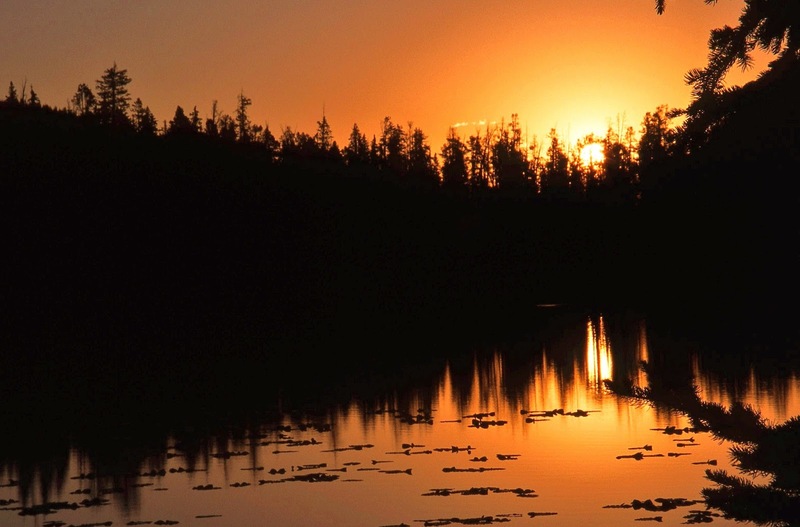 It is PINTO LAKE, even larger, that will be our…. Might sound like a broken record, but again we catch Eastern brook trout. 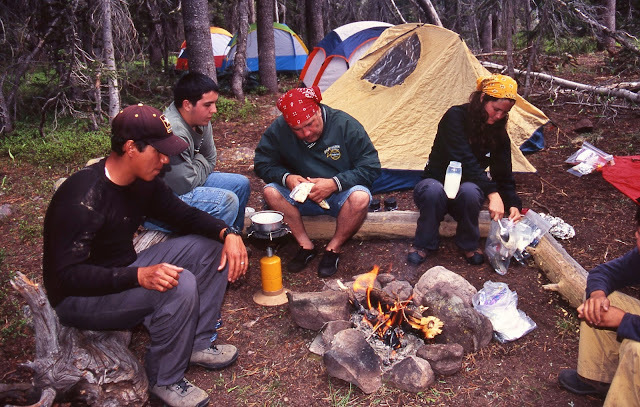 NOW WE HAVE TO GET OUT OUR MAPS TO NAVIGATE TO THE NEXT REMOTE LAKE…..where we have never got to before. All points being wrong. My topographical route shows it being SOUTHWEST, and at least 1.3 miles (to which I have learned you should add 15%). The “trail” was faint at best, unmarked, no signs, no blazes on trees. Often it disappeared and I would just continue where I thought a trail should be, and sometimes found it again….but eventually lost it and so just headed up the mountain southwest. …but this time, while resting, I looked up to see that this old guy was being left behind in the vapor trail of the modern world! 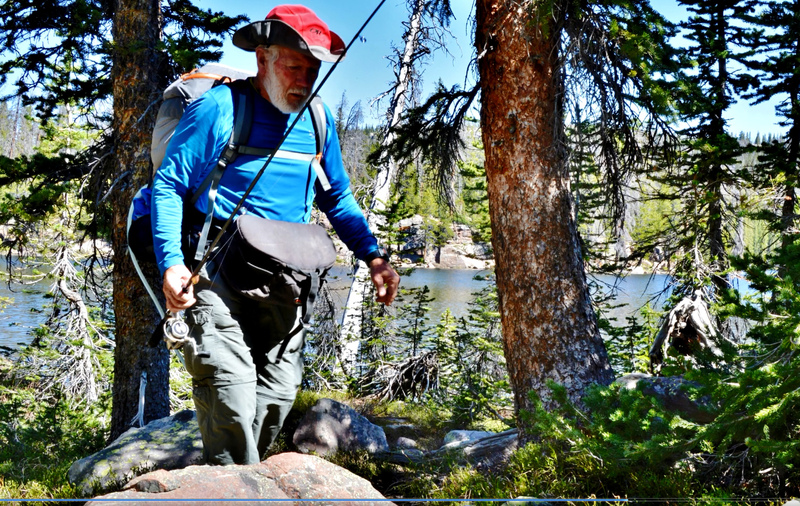 The bushwhack continued…..sometime getting a bit edgy with boulder fields to navigate….. But even there I found incredibly beautiful and delicately waved VISIONS of the past geologic history of our High Uintas, highlighted by colorul (and drab) lichens. Eventually I got up high where I had spectacular views to the North, of Hayden Peak, Mount Agassiz, and Spread Eagle Peak. Finally my wilderness navigation worked out taking me to the last remote lake I had never got to before…..and MARGO LAKE came into view which will be our……. Over Margo Lake we see through the trees Mt. Baldy where in 2015 I had spent a week acclimatizing myself to high altitudes…..and below in the fish-eye view, we see Mt. Agassiz on the right. I set up my camp…dutifully more than 200 feet from the lake, then went down for water, and had the good fortune of finding BOG LAUREL, in all of its stages of development, which follow…..ENJOY! …..and here is the GIANT ANT! 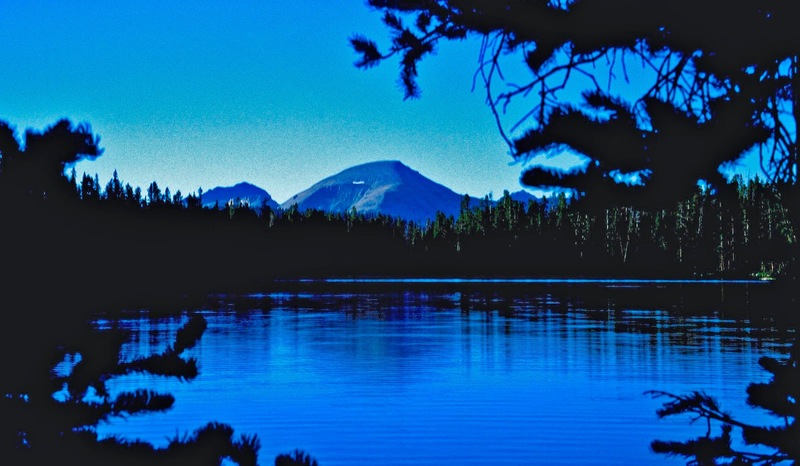 Then I went fishing…..with Mt. Agassiz looming over this remote lake. For a while there seemed to be no sign of fish life. But, then when about ready to give up, a quite large trout followed my lure. Soon I had one on and brought him in. It looked like a Rainbow trout. Another one showed a slash under its jaw making it a native cutthroat trout, but seemingly with coloration also of a rainbow. 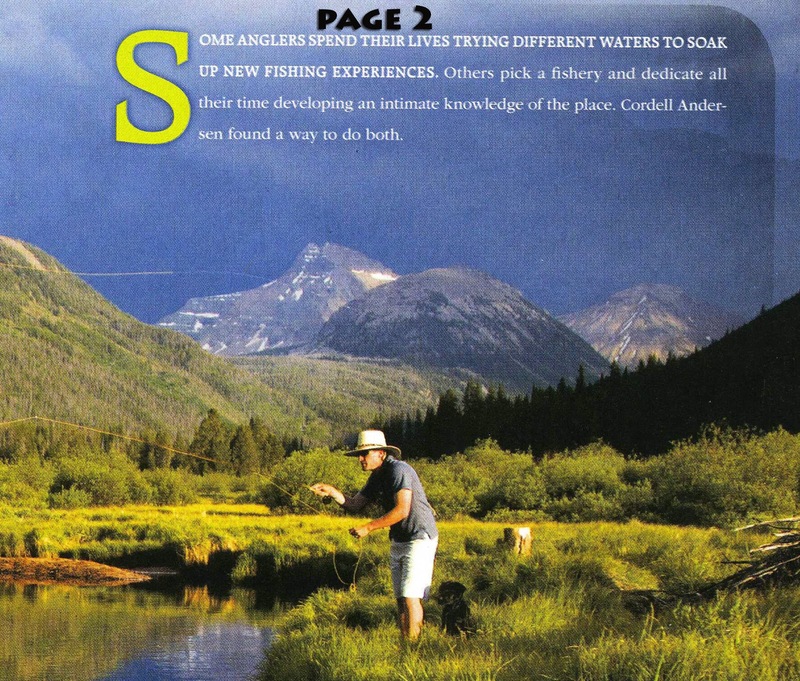 This appears to be a Strawberry cutthroat trout, which is the cutthroat we stocked in the past in the Uintas. 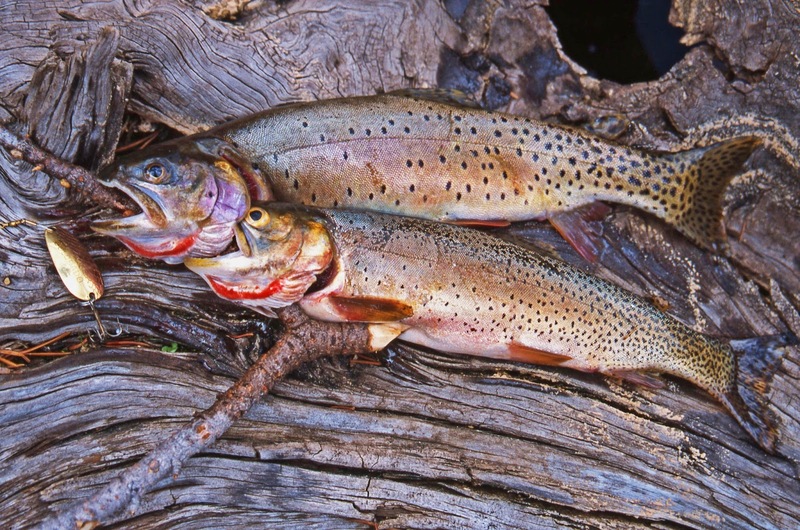 These fish were taken as eggs from wild brood-stock in Strawberry Reservoir that were primarily Yellowstone cutthroat trout with some rainbow hybridization and perhaps a little Colorado River cutthroat influence. 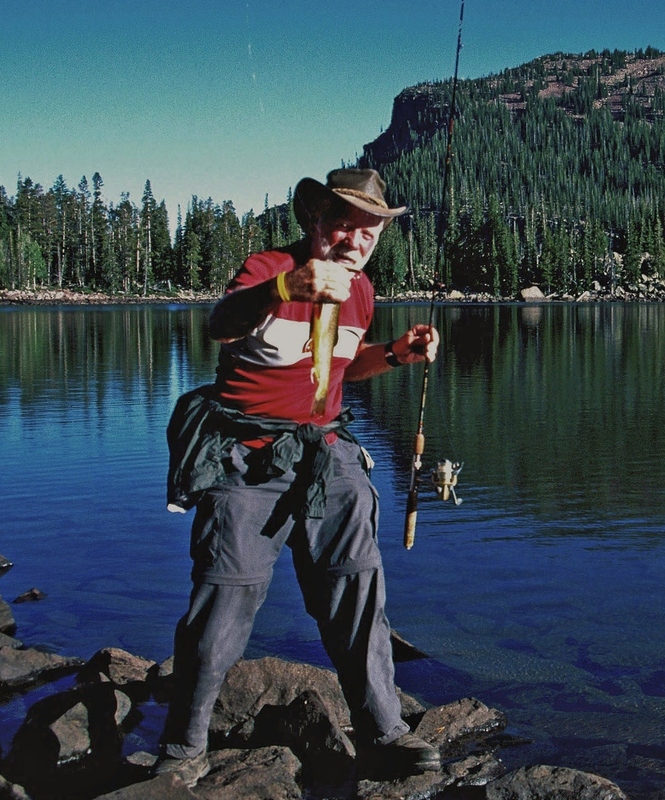 We suspended stocking these fish in the late 1990’s because we wanted to utilize the native cutthroat in stocking programs in the High Uintas which is the Bonneville cutthroat trout in the Provo, Weber and Bear River Drainage; and Colorado River cutthroat trout in the remainder. 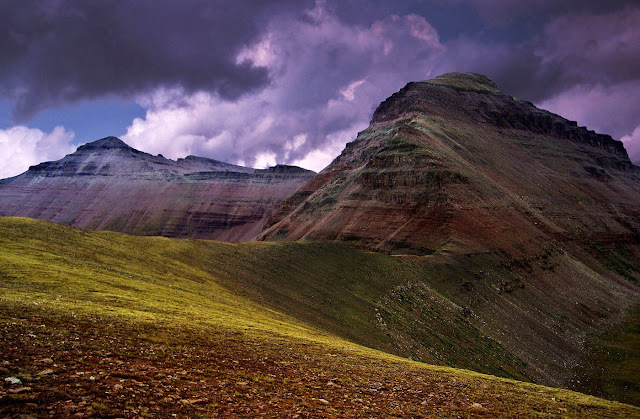 Then up to MARGO PASS, about 10,600 ft…… about the same as Hades Pass. 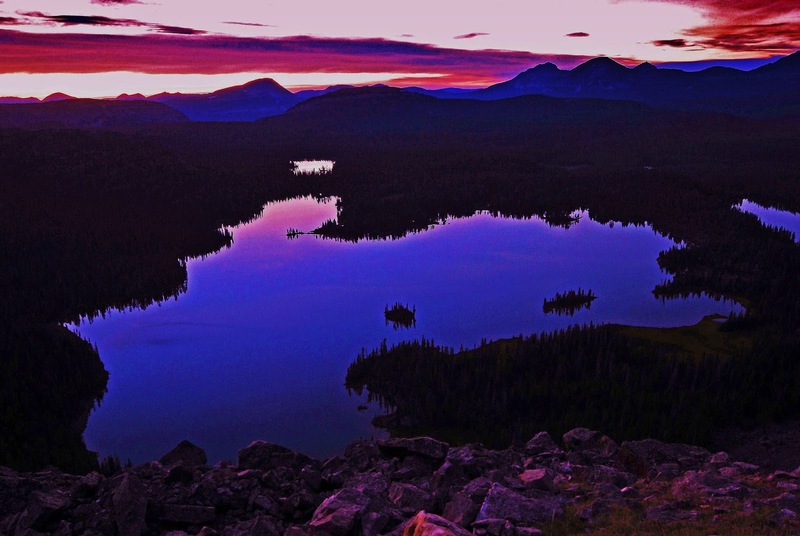 IMPORTANT NOTE: To bushwhack and boulder-hop up the mountain to Margo Lake I so totally wore myself out that the fatigue had me getting sick, weak and, I thought, unable to get back to civilization….so in the Backpack #1-2015 GRANDADDY LOOP photo/essay I detail a life saving SURVIVAL STORY that got me up to this pass–with a smile on my face, and back to civilization. If you haven’t already, you might want to check that out clicking on that link and scrolling down to the Margo Lake portion to memorize that life saving “REST OF THE STORY” that of course could save your life too! You might have noticed by now that I’m from the time when we were all fans of Paul Harvey. Here’s the view looking north from the pass with the mountains mentioned, and the Naturalist Basin nestled between Mr. Agassiz and Spread Eage peak. 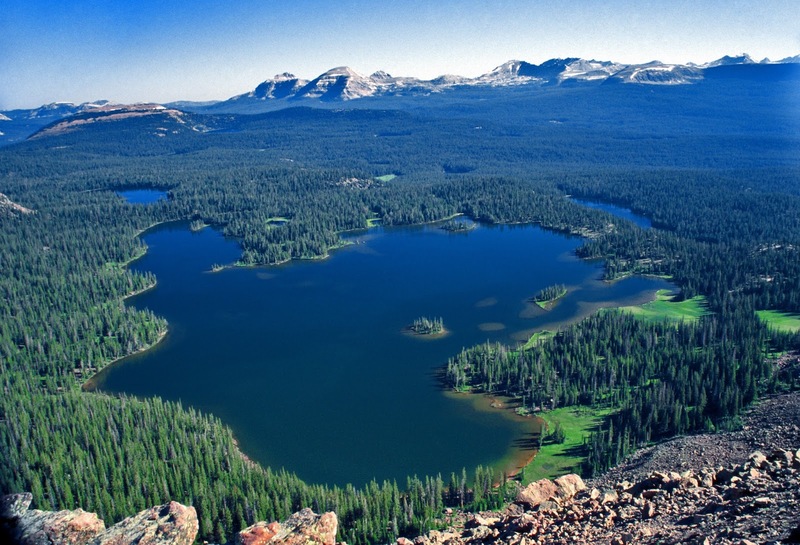 From there we drop down to the south and work our way around quite large and picturesque PINE ISLAND LAKE. 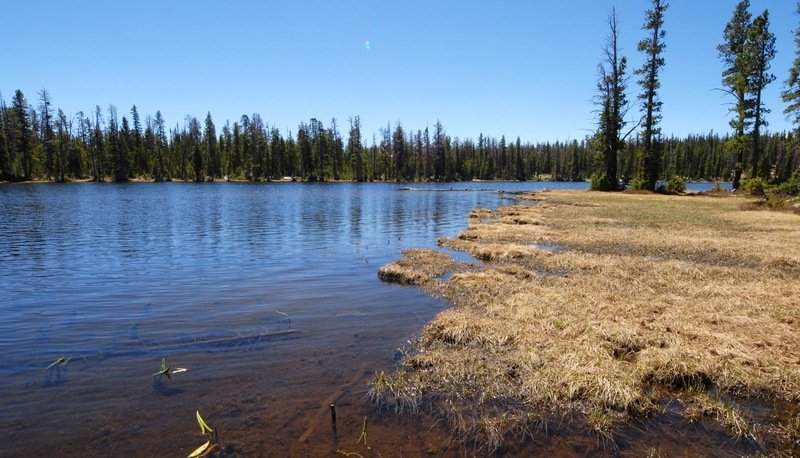 PINE ISLAND LAKE will be our ….. In this panoramic view we look towards Margo Pass, which the extreme wide angle lens sort of flattens out so it doesn’t look like the big deal I felt it was as an old guy! very good fishing if you sweat out going around to the seldom visited other side. 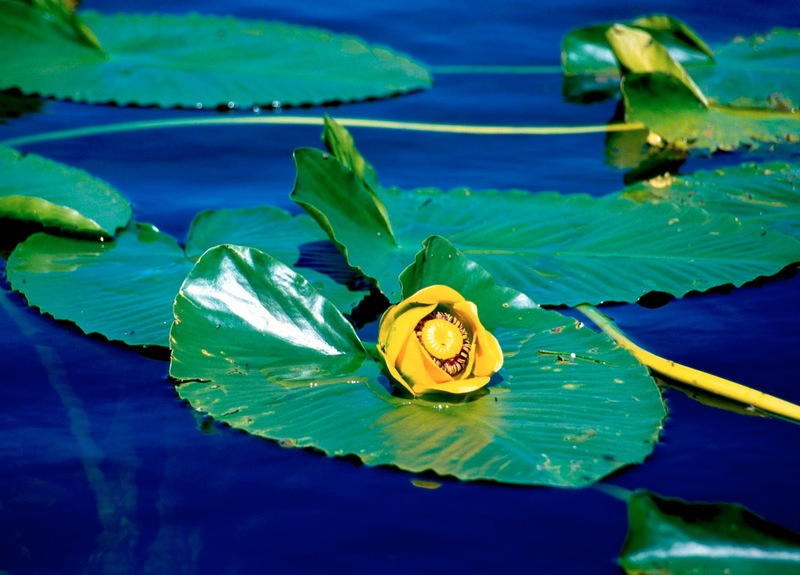 Within a stone’s throw to the east we visit LILY PAD LAKE, which will be our…. In this shot the “lily pads” are just beginning to develop. I’ll insert below the way this beautiful plant develops. Lily Pad Lake is full of Eastern brook trout like the one you see below. 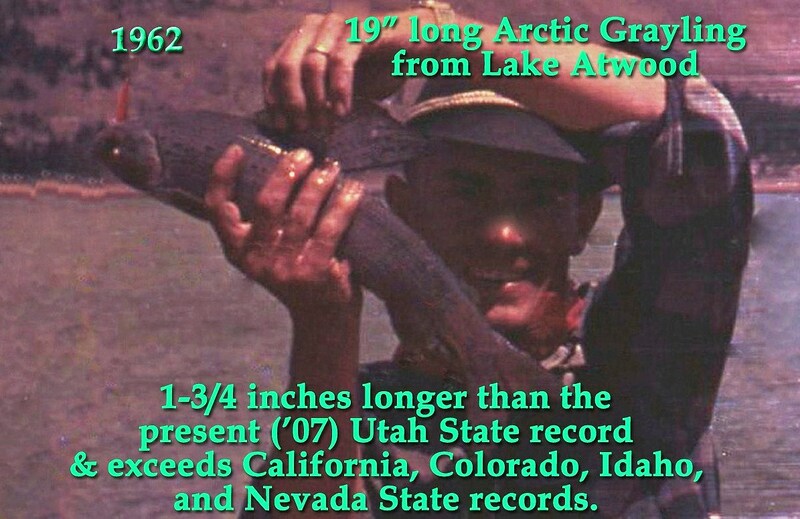 They are more colorful than those found in some of the Grandaddy lakes, but still the COLOR CHAMP is from Porcupine Lake in the Oweep Drainage at the base of Squaw pass….I’ll insert one of them below. FISH HATCHERY LAKE, which will be our…. 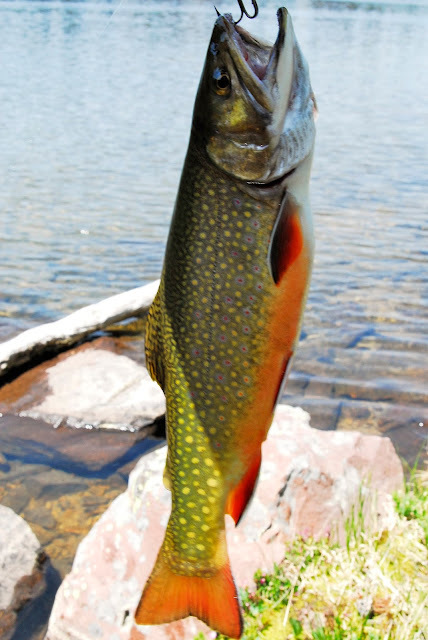 This nice lake produces brook trout like the one we see below. From Fish Hatchery Lake we bushwhack up the mountain to the west and come to our next remote lake, which is…..
FARNEY LAKE, that will be our ……. 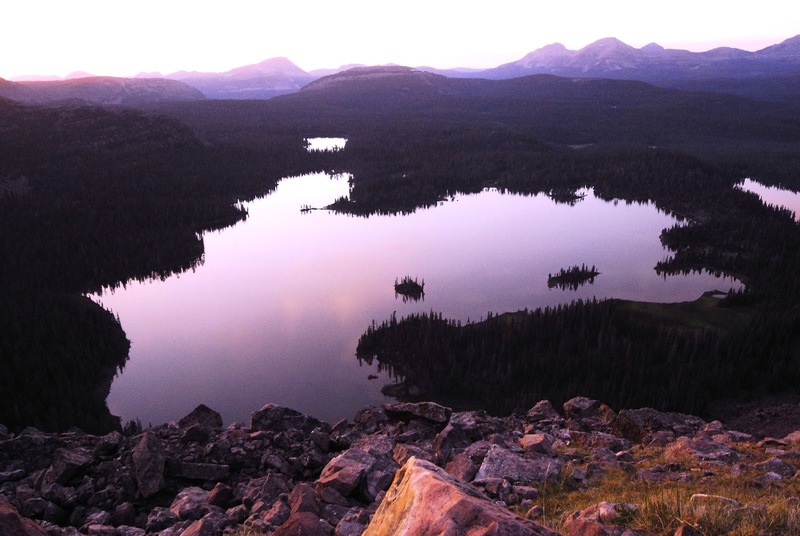 There is no trail to Farney Lake, so bushwhacking is the only way to get here. Farney Lake contains Arctic Grayling, from my experience not too large. 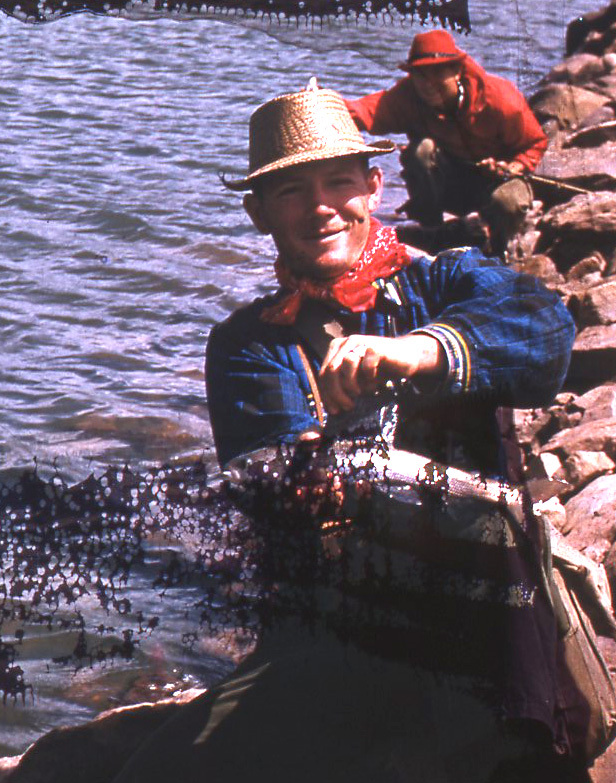 You have to catch them with flies, using fly fshing equipment, or a fly and bubble with your spinning gear. 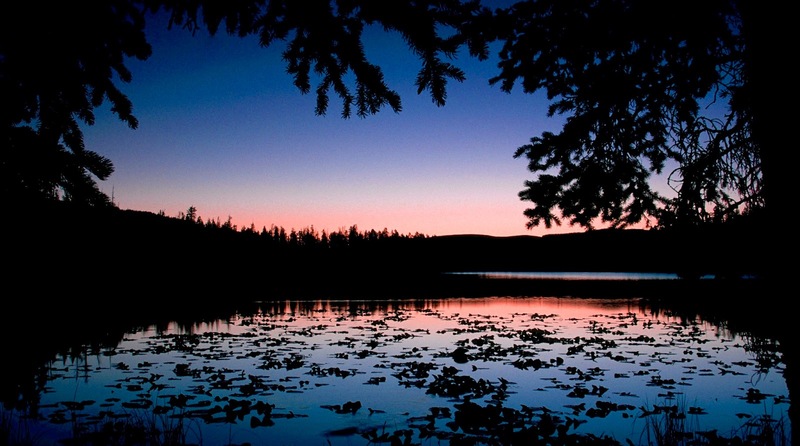 From Farney Lake, we will now go to another remote lake where bushwhacking is the only way to find it. 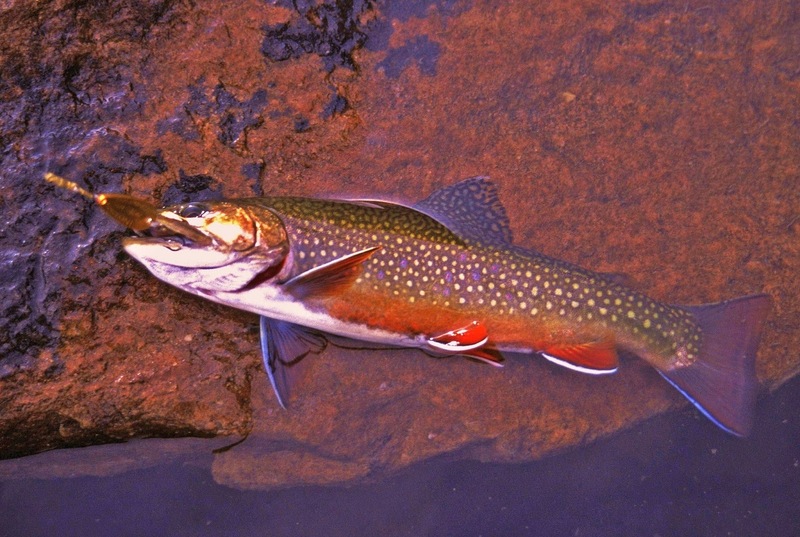 We go southwest a couple of miles and find SONNY LAKE, which will be our…..
Sonny Lake has produced for me some very nice Eastern brook trout, like the one you see below. On other trips to the lake the sign was no where to be found. On that first of 3-4 trips to the lake I worked my way around the entire lake and on the far off western side caught these two magnificent native cutthroat trout each about 16 inches long! …..our next and last lake in the Grandaddies, MOHAWK LAKE, which is our…. 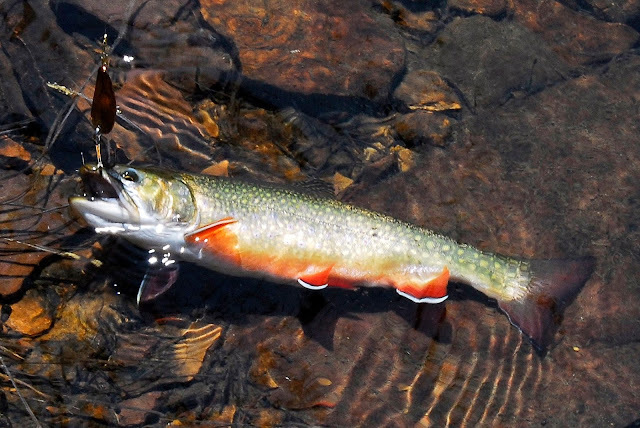 Mohawk Lake contains both brook trout you see above, and native cutthroat trout like the one below. From Mohawk Lake I hike up towards West Grandaddy Mountain, clicking a shot as I go of the angelic COLORADO COLUMBINE, to check some small lakes to see if they had fish…which they didn’t, and there got some telephoto shots of more Rocky Mountain Goats. 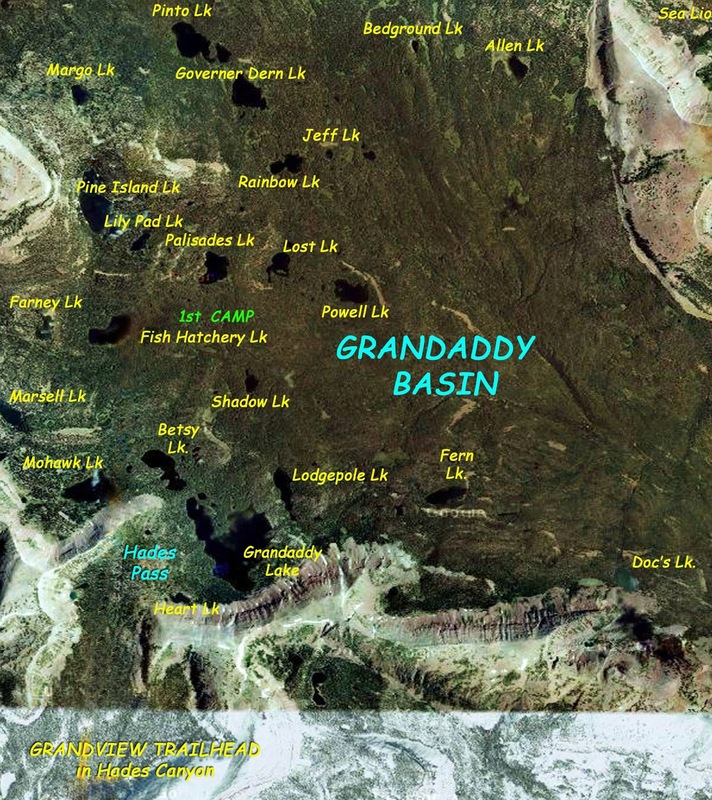 That pretty well completes our loop tour of the Grandaddy Basin, showing all the 24 named, fish producing lakes. Last of all, we did another Family Backpack into the Grandaddies with my daughter, Mahana, son Nephi, and daughter, Cindy, her husband Gisgard, and their children–Isaiah, Maya, and Trinity. 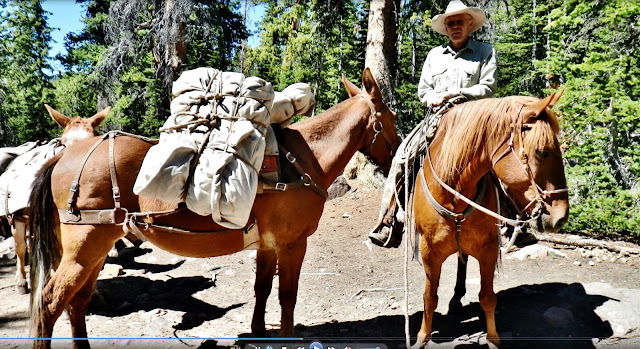 Up the trail goes Gisgard, acting like a pack mule, for his daughter Trinity. That night around the campfire we got into a discussion about wilderness navigation and I showed them how to locate the “big dipper,” and from there “the North Star,” and then took a 45 minute long photograph focusing on the North Star, showing how all the stars in the heavens circle around this star. And say goodbye to a couple of great backpackers…..and to …..
….another wonderful backpacking family met on the GRANDADDY TRAIL a few years ago…..
“YOU DON’T GROW OLD AND STOP BACKPACKING, RATHER STOP BACKPACKING AND THEN GO DOWN HILL AND GROW OLD! 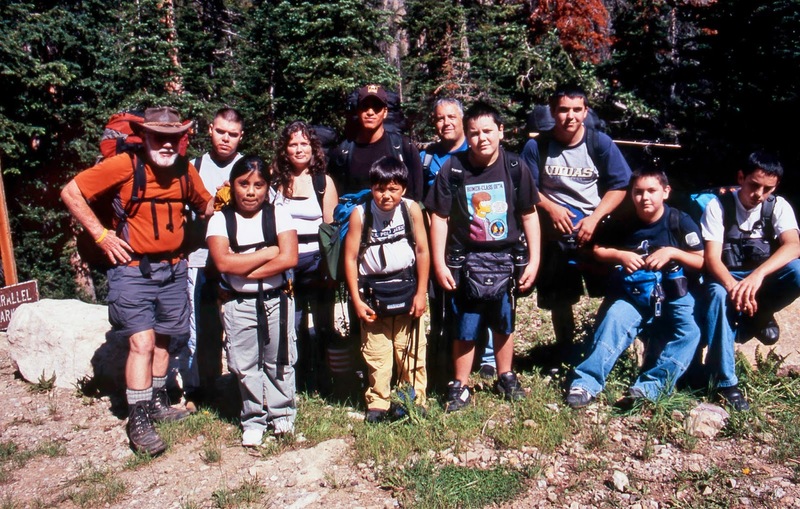 The idea being for me….that I’VE GOT TO KEEP BACKPACKING TO AVOID GROWING OLD….I’m do my darndest in my 80th year–2015! 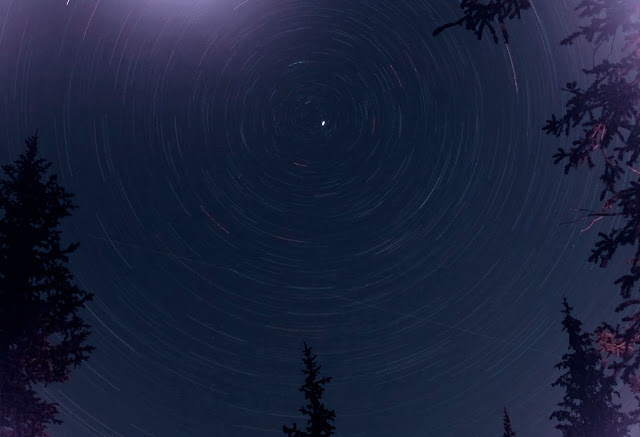 YouTube video: PREPARE FOR BACKPACKING, D-DAY, Into the Wilderness, SPOT Tracker link…. UPDATE June 23, 2015: I achieved my purposes on the Grandaddy Trip getting to the last remote lake & others completing my photo collection of all the lakes in the Basin, and meeting many new wonderful High Uinta Friends….plus having one of those amazing survival experiences and of course photographing many new VISIONS OF NATURE I want to share with all. 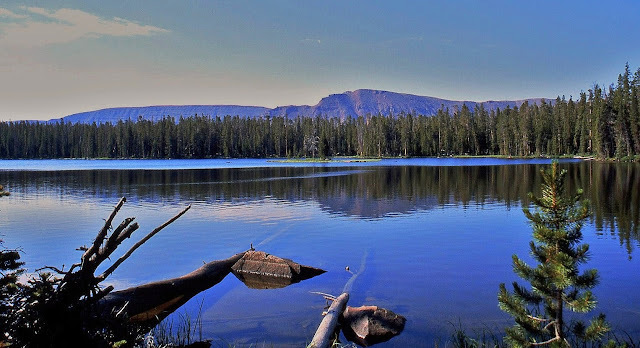 I’ll be working on for me an “epic” photo/essay (& then YouTube video) combining the trip with a documentary including all the lakes which I’ll entitle….. Note: Be patient it will take me a few days….remember my excuse…. I had to do my part celebrating this incredible day–and the GREAT INVASION AT NORMANDY..
..without it and its success the world today would likely be a very different place! Thanks for those incredible heroes…..and since I’ll be now disappearing (another “D-day”) from civilization for nearly a month…had to do my part to celebrate…. 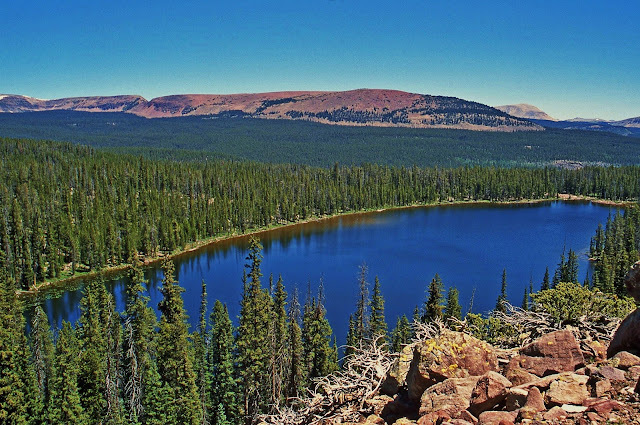 ACCESSIBILITY TO HIGH UINTAS–WEIRD OLD..WHATEVER–DAZZLING VISIONS OF NATURE…ETC. I think I’ve got taken care of all the loose ends to be gone until June 30th, and will leave today (Sat. 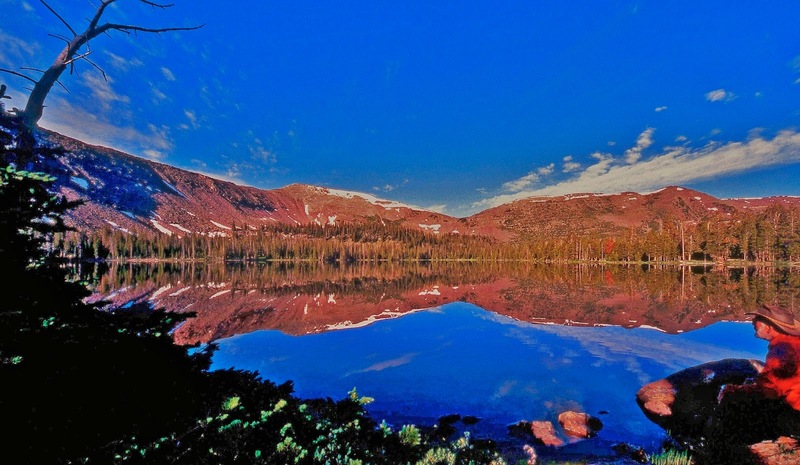 June 6th) for the Mirror Lake Scenic Byway and Bald Mt. 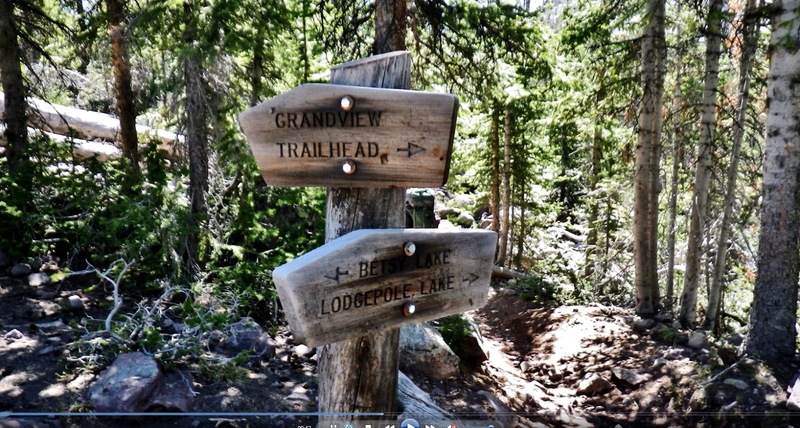 Pass or the parking lot of the Highline Trailhead–likely alternating back and forth for a week to acclimatize my old ( but hopefully “youthfull”) body to high altitudes, as that has been a problem in recent years at the beginning of the backpacking season. 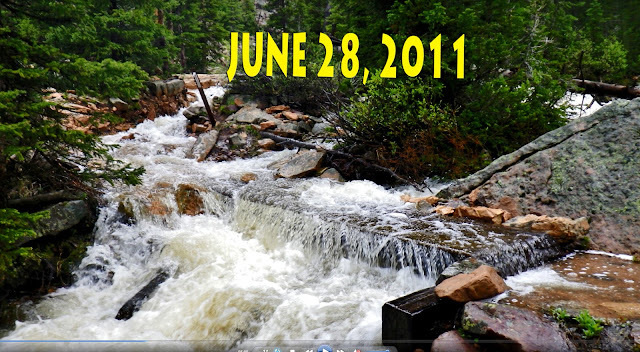 June 11th when I will leave for the Grandview Trailhead to see some friends I haven’t seen in more than 50 years. In that area I will go to where I can have internet access, in Hanna or Tabiona, and program my Tracker for my first backpack. If conditions are right that will be into the Grandaddy Basin. If not, further east where there was less snowfall. My first satellite phone call report to KSL OUTDOORS RADIO will be June 13 from somewhere..between 6:05-8:00 AM…likely after the news at 7:00. In the background from the left: Mt. Baldy, Hayden Peak, Mt. 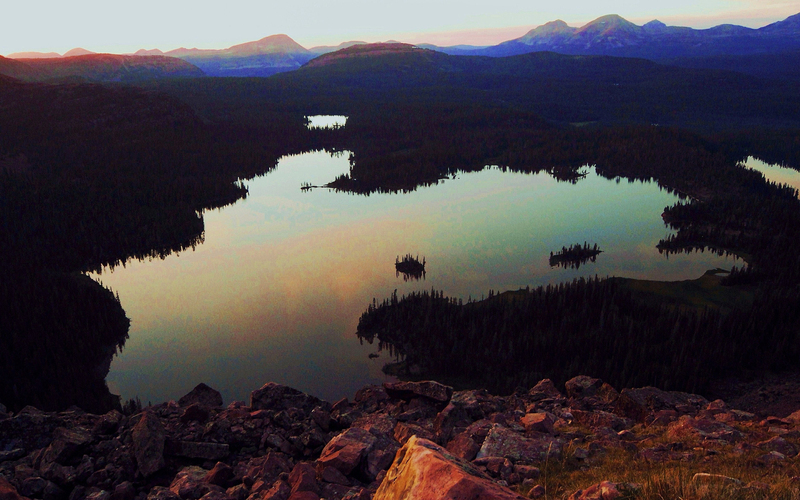 Agassiz, Spread Eagle Mountain, etc.